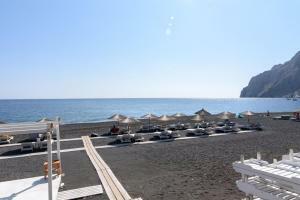 Offering a seasonal outdoor pool and sun terrace, RK Beach Hotel is located in front of Santorini's Kamari Beach. It offers free Wi-Fi in all areas and a restaurant that serves à la carte menus. With a balcony overlooking the garden, this air-conditioned room includes a private bathroom with a shower, a hairdryer and free toiletries. Includes a flat-screen satellite TV. 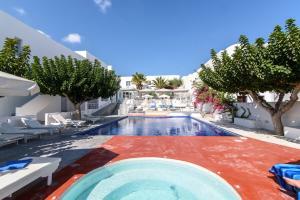 Featuring a balcony with views of the pool and the sea, this air-conditioned room has a private bathroom with a shower, a hairdryer and free toiletries. Includes a flat-screen satellite TV. This air-conditioned room features a balcony with a hot tub, sea and pool views, a flat-screen satellite TV and a bathroom with a shower, free toiletries and a hairdryer. With a balcony overlooking the garden and the mountains, this air-conditioned room includes a flat-screen satellite TV and a bathroom with a shower, a hairdryer and free toiletries.